An enchanting talk by Hanna Wirman at the Bristol Games Hub yesterday. 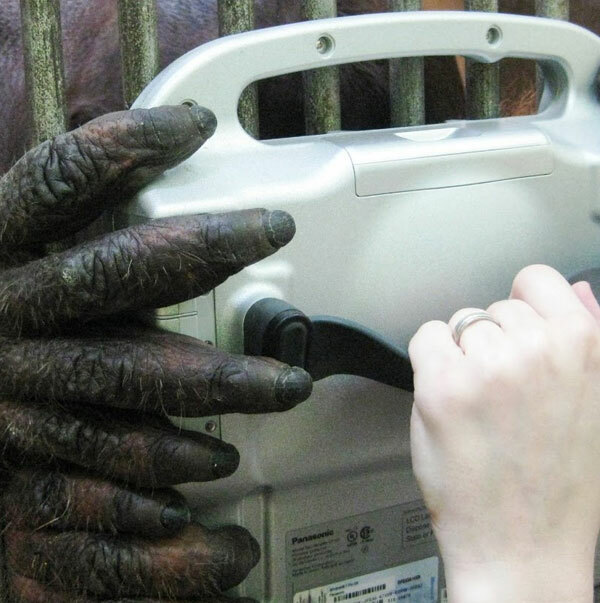 Every time I hear Hanna speak of her research designing games for captive orang-utans it opens up new realms of thought and ideas. The talk was pitched at the game designers at the Hub, Hanna inviting them to think of their imagined end-users or players not only as strangers but as Others. To accept the strangeness of playing with other species in part as a way of thinking differently about the ways in which game design must design its other / audience – with all that process’s ideological and ethical implications. For me, this resonates both with the Gameworlds book – conceptualizing play in the expanded field – and the article on configuring mobile game players as part of the Dancetag project. It was great, as ever, to see such imaginative application of a Cultural Studies critical perspective applied to empirical research and design – Haraway and Irigiray deployed with precision – though I think current Cultural Studies could do with hearing these ideas too. Bekoff: play tolerates asymmetries (species difference as only a particularly marked asymmettry) more than other social behaviour.